You’d never guess by looking at this sweater that it’s made from two simple rectangles! 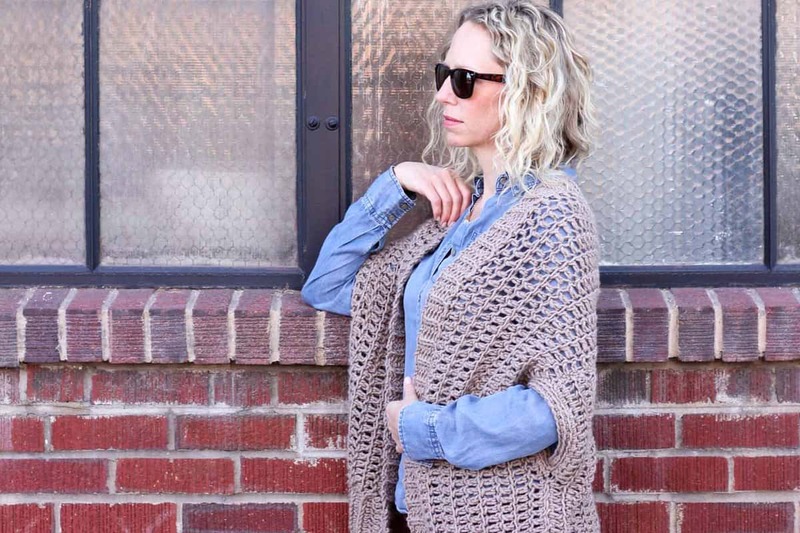 The “Cocoon Cardigan” free crochet pattern is great for beginners who are looking to expand their skills or advanced crocheters who want a quick, stylish project. As always the free pattern is below or you can purchase the printable, ad-free PDF for $2.75 here. This beginner crochet sweater pattern is a collaboration with my friends at Lion Brand Yarn. This post contains affiliate links. Is there anything that you think you’re just intellectually incapable of doing? Like, you just couldn’t do enough brain yoga to attain a certain skill or achieve a desired result? I’ll give you some of mine: designing a decent looking and functional spreadsheet, cleaning up one project before starting another and designing a crochet sweater. Well, I haven’t made a spreadsheet (even an ugly one), I’m still sitting amidst a dozen 97% finished projects, but I HAVE designed a crochet sweater! I was just always so intimidated by figuring out the mechanics of a sweater. Sleeves? Drape? Sizing? Ugh. Where do you even begin? With two rectangles that’s where. 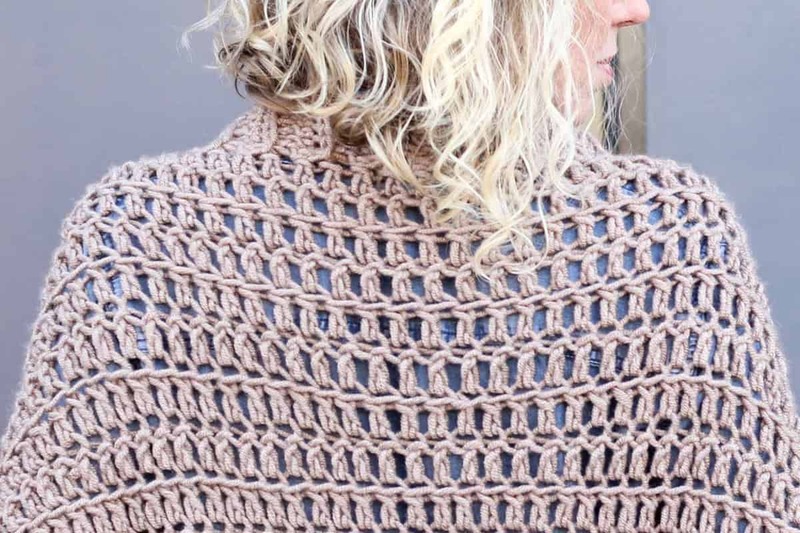 I’m so excited about this “Cocoon Cardigan” free crochet pattern because it’s literally made from two super basic shapes. 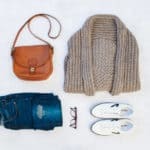 If you can crochet a scarf, I think I can teach you how to make this simple sweater pattern. 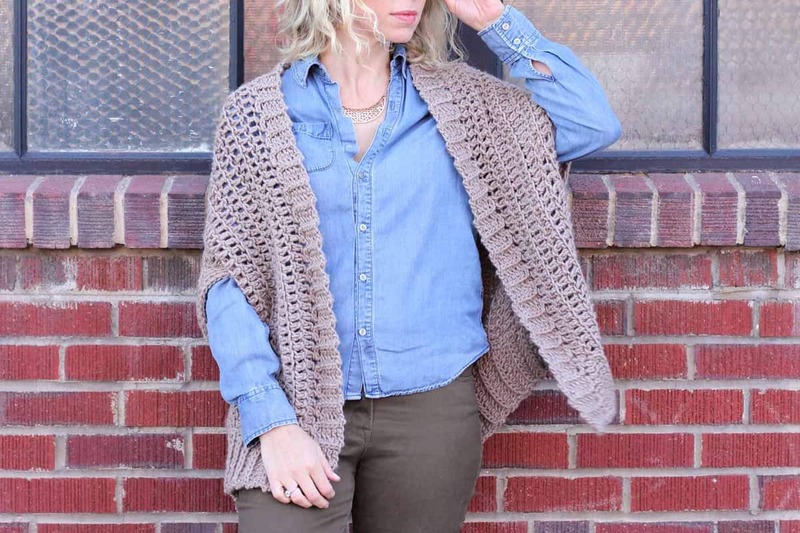 For this “Cocoon Cardigan” free crochet pattern, I used Lion’s Pride Woolspun yarn. (Remember this Faux Cabled Bun Beanie or the fingerless mitts project in my Modern Crochet 101 course, both made with Woolspun? Clearly I love this yarn!) The reason I chose Woolspun yarn for this project is because it’s surprisingly light for how nice and chunky it is. The result is a quick cardigan project that has beautiful drape and almost a certain “bounce” from the light, yet substantial, yarn. 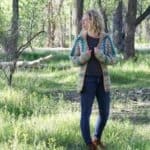 UPDATE: Lion Brand has created a kit that includes all the yarn you need to make this cardigan as well as a copy of the printable pattern. You can score the kit for 20% off through March 14, 2017! 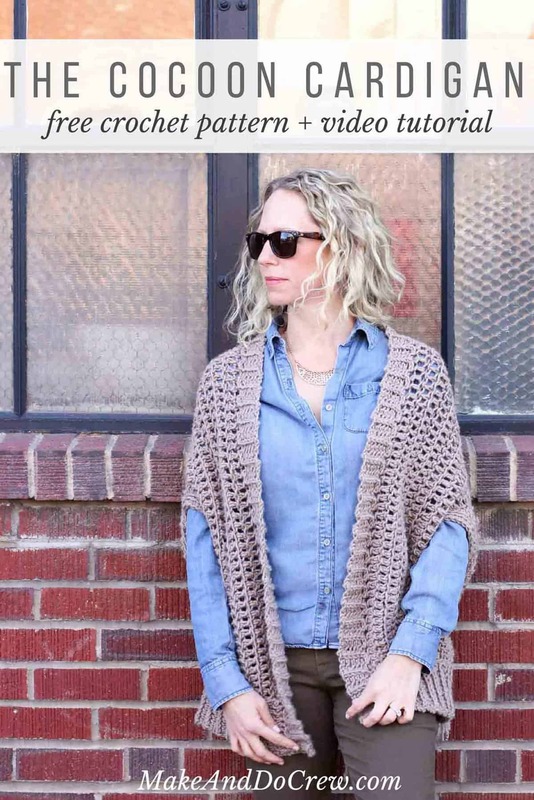 Check out the Cocoon Cardigan kit here. I love that I can roll this cardigan up and carry it in my purse for if I get cold at a restaurant, movie or let’s be honest, anywhere I ever go because I always seem to be cold. 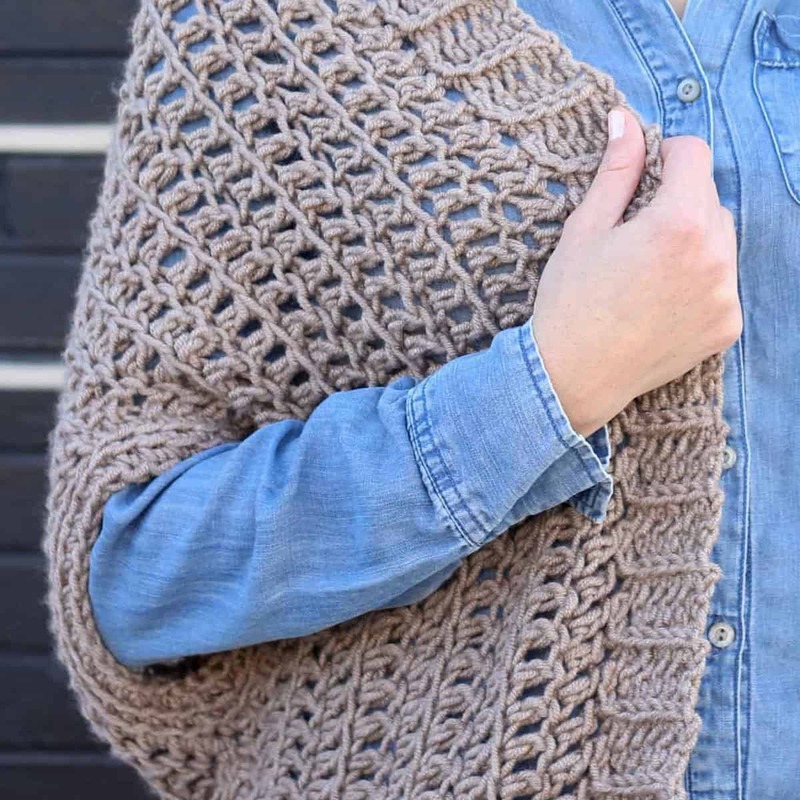 The “Cocoon Cardigan” free crochet pattern is quite like it sounds–a cozy cocoon to wrap up in on a chilly day. 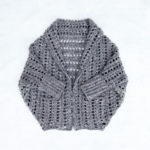 This cardigan free crochet pattern and tutorial includes a lot of photos. It’s always my goal to include enough information for a newer crocheter to be able to successfully dive into my projects. To this end, I put together a quick tutorial below on how to work the ribbing on this sweater pattern. I definitely recommend taking a gander at it as it’s so much easier to comprehend some of this fairly straightforward techniques in video than in writing. Please do not publish or share this pattern as your own. You may make items to sell or donate with this pattern. In exchange, please link back to this post and credit me as the designer. You can view all my policies here. Do NOT use my photos as your own sales photos. ­­Now go make something awesome! One size fits most adult women. The draped nature of this cardigan accommodates a wide range of body sizes. • Cardigan is worked in two large rectangles that are joined and then finished with ribbing. • When attaching yarn to work a new section of the sweater, my preference is to use a slip knot. To do this, make a slip knot and insert your hook. Then insert your hook in sweater where yarn will be attached. Yo and pull loop through slip knot on hook. Tighten slip knot. • After row 1, the double crochets are all worked into the front loop of the previous row of stitches. 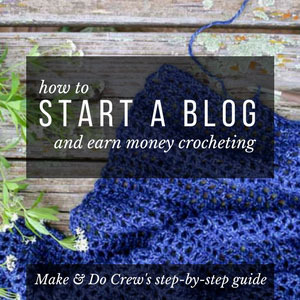 • Beginning in row 2, instead of chaining 3 at the beginning of each row, you’ll be working two single crochet on top of each other. 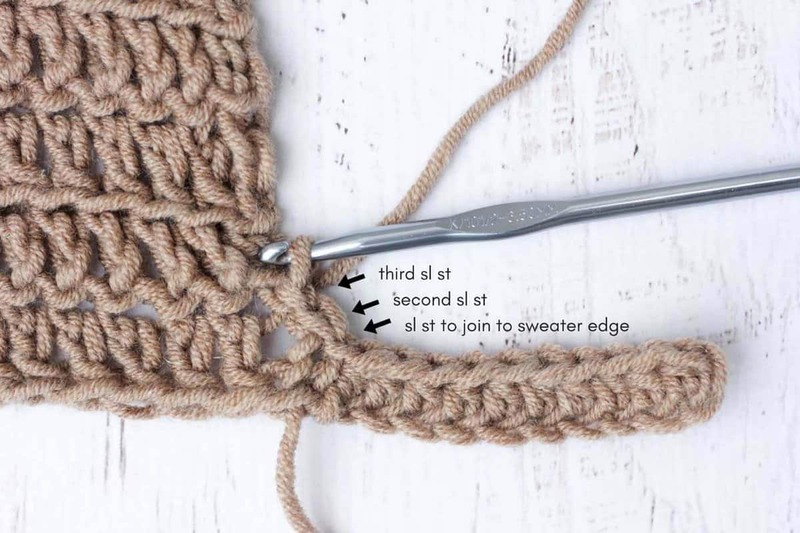 This minimizes the gap usually created by the chains in a row of double crochet. See photo below this section for a tutorial in how to do this technique. Using larger hook, Ch 28. Repeat row 2 until piece measures 27.5” (approx. 25 rows). Fasten off. 1. (Do not chain.) Insert hook in front loop of first double crochet. 2. Complete normal single crochet. 3. 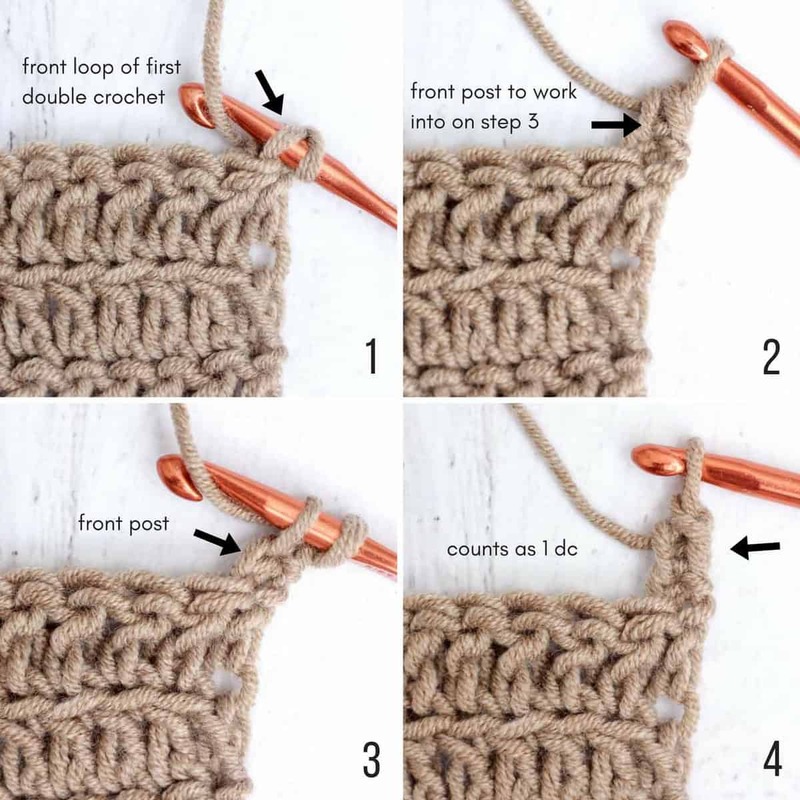 Insert hook under front post of single crochet from step 2. 4. Complete normal single crochet. Using larger hook, Ch 103. Rows 3-10: Repeat row 2. If you’re using Lion’s Pride Woolspun yarn for this (or any yarn with an acrylic component), you can block your pieces by spritzing them with the steam of an iron from about 5” away. Be cautious not to get the steam super close to the yarn or touch the iron to the yarn because this will “kill” the acrylic and change the texture of the yarn. Sew pieces together along pinned edge using the mattress stitch. • See the ribbing tutorial video above for a demonstration of this technique. Note that the video is in reference to adding the collar ribbing, but the technique is the same for this section. 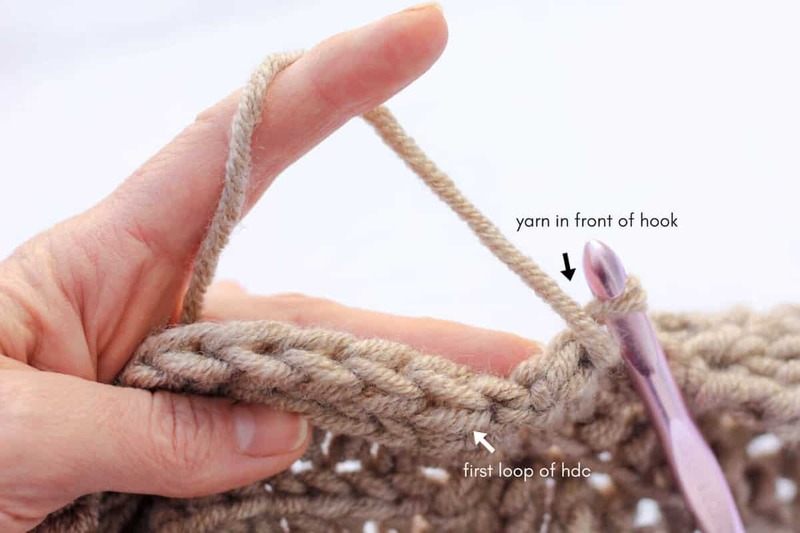 • In addition, 1DogWoof has an excellent video that illustrates this technique of adding ribbing. Note that the stitch counts for her ribbing are different than what is included here, but the basic concept is the same. 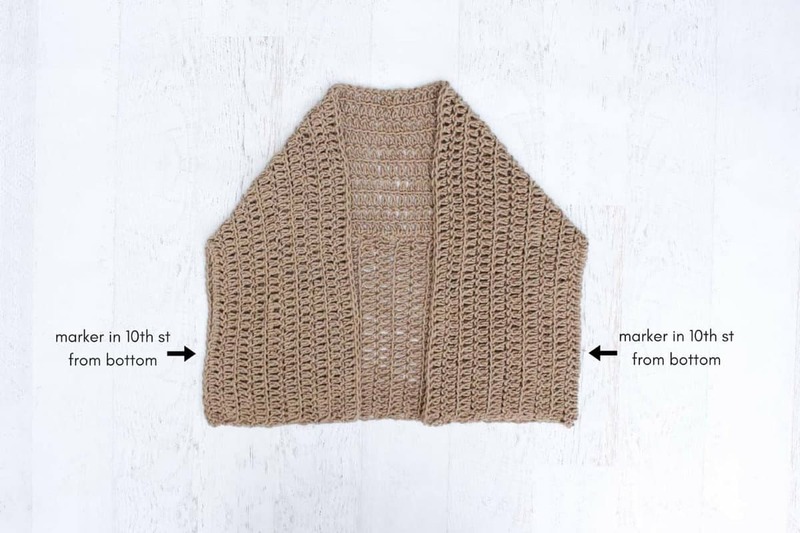 • When you’re slip stitching into the bottom edge of the sweater to attach the ribbing, insert your hook under the nearest two strands of yarn in the sweater bottom panel. 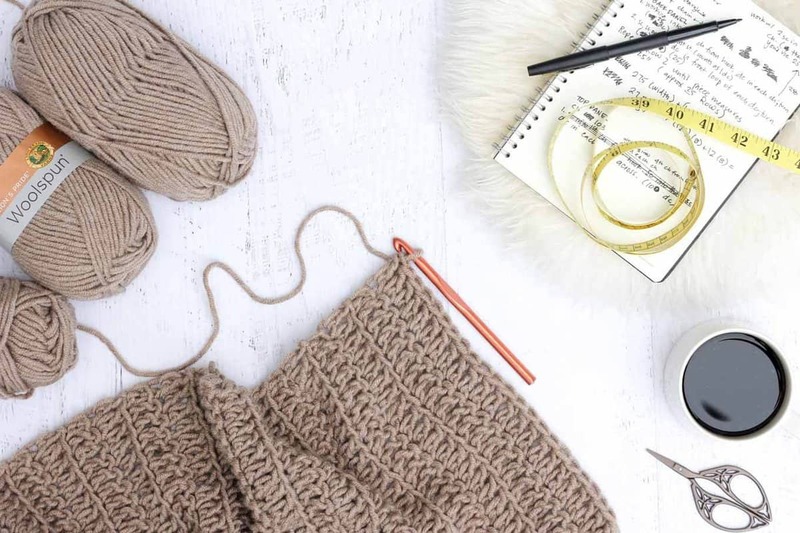 One strand will not be strong enough to support the weight of the ribbing and three strands will begin to make a bulky seam where the ribbing meets the sweater. See video tutorial above this pattern for more information. • The chain 2 at the beginning of row 3 and subsequent odd numbered rows doesn’t count as a stitch. 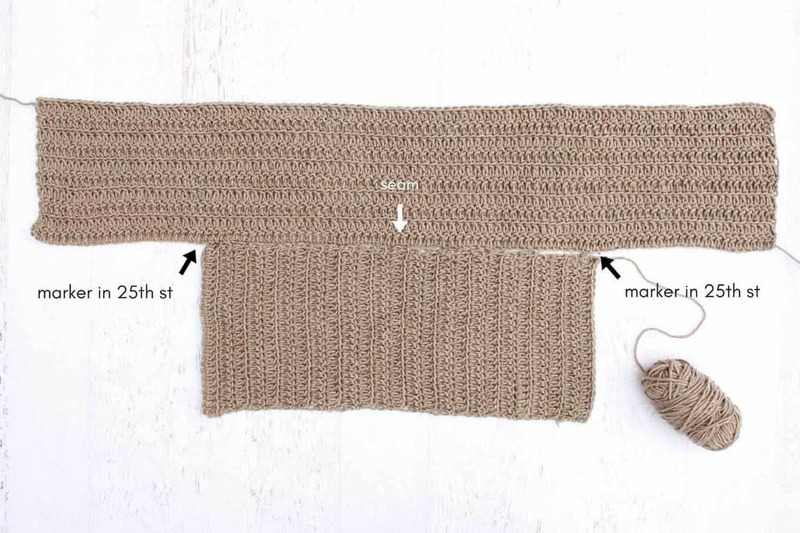 Attach yarn with a slip knot at bottom front corner of sweater on what would be the left side when wearing it. Using smaller (L) hook, ch 11. Repeat rows 2 and 3 around entire sweater bottom. If ending with a row 2, do not fasten off yarn. If ending with a row 3, fasten yarn off. • For the first and last approx. 4” of collar ribbing (while working along bottom ribbing section), the slip stitches to join the ribbing to the sweater edge are worked at a slightly different interval than for the rest of the collar ribbing. In row 3, for example, work first sl st into the stitch directly above stitch row 1 was attached in. (Therefore, each stitch along sweater edge should be slip stitched into once.) See the ribbing tutorial video above for a demonstration of this technique. For the remainder of the collar ribbing that isn’t worked into the bottom ribbing, work the first sl st of a row 3 into the same st the previous row 3 was attached in. (Therefore, every third stitch along the sweater edge should be slipped into twice.) See video for far clearer instructions! With RS of sweater facing out, use a slip knot to attach yarn at bottom corner of ribbing at what is the right side of the sweater when wearing it. Using smaller (L) hook, ch 6. Repeat rows 2 and 3 around entire collar. Fasten off. • If you’re right-handed, work the sleeve clockwise. If you’re left-handed, work it counter clockwise. • For rounds 2 and 3, work first sc in the same sc you sl st into at the end of the previous round. When ending a round, do not work a sc in the sl st from the previous round. With RS facing, attach yarn at bottom of sleeve. Round 1: Using smaller (L) hook, ch 1, sc in same st yarn attached in, sc around sleeve working 1 sc in each st, sl st to first sc of round to join. Do not turn. Round 2: Ch 1, scblo in each sc, sl st to first sc of round to join. Do not turn. Fasten off. Repeat for second sleeve. Weave in ends. Lightly block cardigan ribbing using the same steam technique used previously. There is no need to pin the finished sweater to block it this time unless there is an area you want to stretch or smooth out. 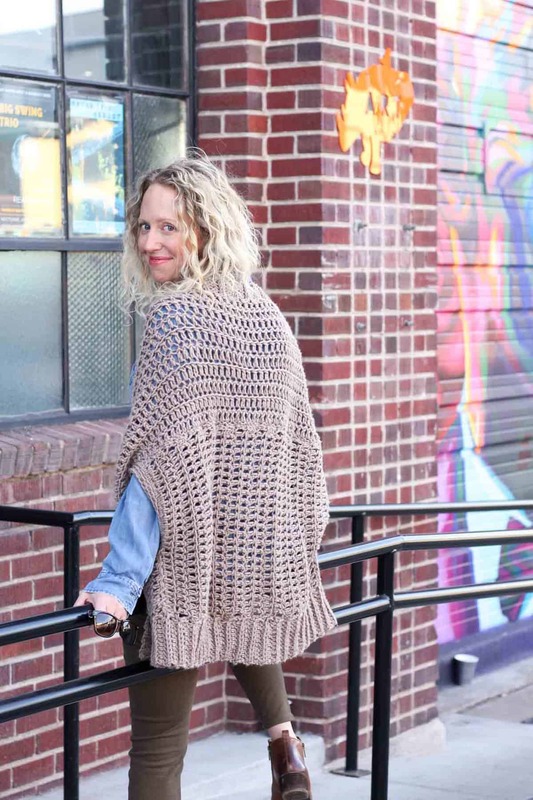 Curl up in your new cocoon cardigan like a cozy little caterpillar! 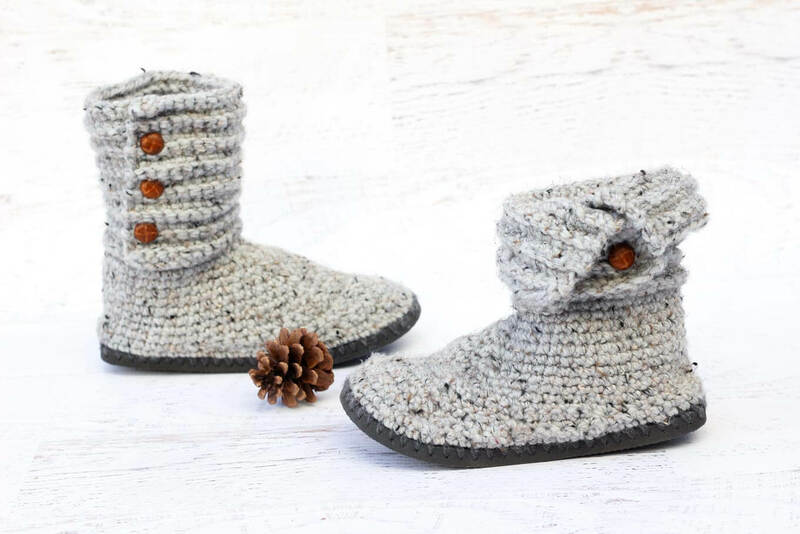 You might also like my “Cabin Boots” free crochet pattern that uses flip flops for soles! I already have PDF , can’t ever download your patterns ????? I’m sorry, Pat. I’m not sure I understand your question. Did you purchase the printable PDF? This is a great pattern! Crocheting a garment is one of my goals for 2017. This cardigan looks like an easy starting place. Thanks for sharing your talent & patterns. Gorgeous cardigan! Putting this on my “to hook” liar! Thanks for the pattern! *list not liar! Stupid autocorrect! ? PS. My mother-in-law’s name is Charmaine. It’s a beautiful and unique name that I don’t hear that often! You’re welcome, Robbie! Thank you! Yay! I’m happy to have you here, Jo! Have fun with the cardigan! Your pattern is a sensation!! ‘I’d like to make 2 of each panel and stitch both ‘T’ shapes together leaving a sizable opening on top in the middle for the head. Embellish or leave plain @ the neck and shoulders. If I’ve explained myself correctly you could have a comfy, slouchy, and warm pullover sweater. Your pattern is a sensation!! ‘I’d like to make 2 of each panel and stitch both ‘T’ shapes together leaving a sizable opening on top in the middle for the head. Embellish or leave plain @ the neck and shoulders. If I’ve explained myself correctly you could have a comfy, slouchy, and warm pullover sweater. (I’m new to things of the computer world. So please forgive if I do everything wrong. No one to help guide me.) Thank you. Are the bottom and top panels made with the N or L hook? This is so cute! Can’t wait to get started. Great question. I’ll clarify that in the pattern. Both rectangles are made with the N hook. The L is just for the ribbing. Thanks for asking because I bet other people are wondering too! I really liked this pattern, but after blocking in the way you suggested it’s still quite short, if made another but added extra rows would that work too? Do you think this will be ok made in cotton yarn? And would u have to add anywhere? I love your designs! I also love that you’re from Colorado too. One question, will you be making patterns for plus size people too? I think I’m the only chunky monkey in the metro area lol but just adding inches to a pattern does not always work. Keep up the fabulous work! Hi Sarah! So fun to hear from a fellow Coloradan! Haha, Denver can really make anyone feel like they should be out running a triathlon or something, can’t it? I always try to add as many details as possible on how to customize a pattern, but I also try to avoid speculating about making a version I’m unsure about. I’ll def keep your feedback in mind as I want crocheting clothing you feel good in to be accessible to everyone. Hi! Today I finished this cardigan! You did a great job with the pattern! Very easy to make and to understand. I´m so proud I made the whole of it all by myself! would love to know where this free pattern is located. The heading says free pattern! The free pattern is right above this comment area, right below the pink heading that says “Cocoon Cardigan”.